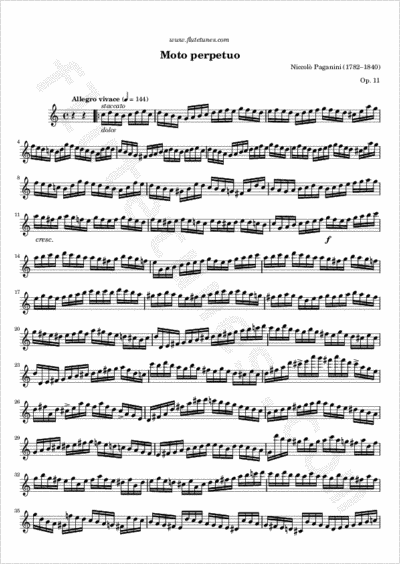 Paganini's now-famous Allegro vivace in C Major for violin and orchestra, usually simply called “Moto perpetuo” or “Perpetual Motion”, was composed in 1835, but remained unpublished at the time of the Composer's death in 1840. It was first put to print in 1851, but it did not really enter the standard repertoire until 1932, when Fritz Kreisler made a new transcription of the work for violin and piano; other violinists were quick to follow Kreisler's lead, and by mid-century the piece had become a staple of virtually every virtuoso's encore list. In our transcription we have tried to imitate the way James Galway plays this piece. If you think that 144 BPM is too fast, you should go get some recordings by famous violinists like Yehudi Menuhin: they manage to play the 189-measure-long run of machine-gun sixteenth notes at a constant tempo of 200 BPM! Of course, unless you are a really advanced player you should not attempt to play this piece at full tempo. Instead, think of it as an etude, and play it slowly as you would do with scales and arpeggios. Great flutists normally use an extended technique known as circular breathing in pieces like this one, but the average player should simply remember to always breathe musically… when at all possible!